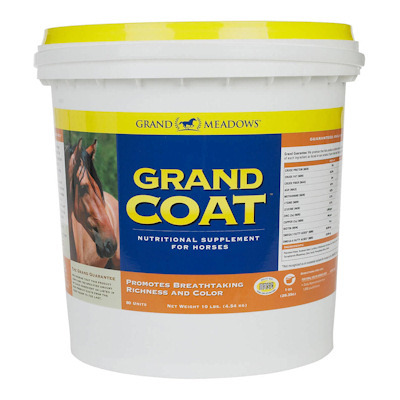 Grand Coat by Grand Meadows is a superior equine supplement for skin, hooves and coat. Nutritional supplement for horses provides a rich source of omega fatty acids, key minerals and amino acids, as well as lecithin, which supplies phospholipids, a vital requirement maintaining healthy skin, hooves and coat color. Diamond V probiotic yeast supports the digestive system and helps keep bacteria in the large intestine functioning effectively. Improves utilization and efficiency of all ingredients to promote breathtaking richness and color. Grand Coat gives your horse the "wow" factor. Each 2 oz serving contains 10,000 mg omega3 fatty acids, 2,750 mg omega6 fatty acids, 525 mg methionine, 437 mg lysine, 250 mg zinc, 25 mg copper, 1 mg biotin, lecithin and ascorbic acid. Daily Feeding Level: 2 oz daily for 1,000 lb horse. 10 lbs = 80 servings.